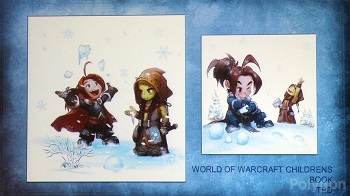 Snowfight is a passion project from the head storyteller at Blizzard. Blizzard's Warcraft has a pretty sizable body of lore, so much so that it built an entire world around it. Now, that lore's branching into a new territory with its first official childrens book. Entitled Snowfight, the book is a passion project from senior VP of story and franchise development Chris Metzen and illustrated by Blizzard artist Wei Wang. Blizzard recently announced the book at the San Diego Comic-Con, according to Polygon. Metzen said that the idea came to him while watching his children growing up and asking questions about Warcraft's characters. Working on the book was a pleasant change for the lore master. "There was just something about these ideas... that just felt really fun and like getting back to basics," he told Polygon. Wei Wang has been an artist as Blizzard for years and has contributed to most of its franchises. A selection of his artwork can be found here. "It's so weird but it's one of those passion projects we wanted to chase," Metzen said. "I hope it just pops." While Blizzard has published maps, novels, and lore compendiums, it's never released a kids book before. I'd love to see what a Diablo kids book would look like. Gather around kids, stay awhile, and listen.